(BPT) – Spring is a time of renewal and home improvement. More and more, homeowners are looking for maximum practicality and durability from everything in their home. They won’t, however, sacrifice style and aesthetic to achieve it. Fortunately, home products continue to advance, be it waterproof technologies or scuff-proof surface finishes, all while maintaining the on-trend style and beautiful details design-savvy homeowners seek. The most impactful way to refresh the home is starting from the ground up with flooring. Many homeowners are drawn to the beauty of wood floors, but worry about spills or kids and pets tracking messes through the house. 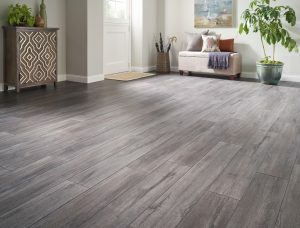 Retailers like Lumber Liquidators offer an array of waterproof and water resistant flooring styles. Adding baseboards and moldings to walls creates a rich and custom look. However, these finishes are often the first to show the wear and tear of high traffic areas. Baseboards treated with a high gloss, washable and stain-resistant paint are better able to withstand abuse, and they come clean with just a little soap in water. Countertops are another design centerpiece of the home, and beautiful products abound. Quartz brings the look of stone and the variation of granite, with less maintenance. Butcher block counters are on-trend, add warmth and dimension, and are easy to repair. A good varnish helps maintain the wood and prevent staining. Wallpaper has seen a resurgence in design circles, with detailed patterns and bold prints that can bring whimsy to spaces. Many homeowners experiment with a bold pattern in a smaller space, like a powder room, but worry about the suitability of wallpaper for rooms where moisture is common. More brands carry water-resistant wall covering materials. Vinyl wallpaper works best in bathrooms and kitchens that are prone to stains and water. When homeowners see a look they love on Pinterest or in a design magazine, there’s likely a product or material to help them achieve it while protecting their investment. This entry was posted in Real Estate on May 9, 2017 by Mike.